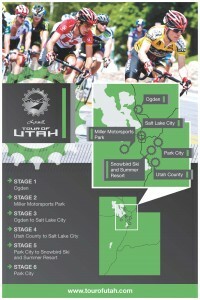 Host Cities for the 2012 Larry H. Miller Tour of Utah. Click on image for a larger version. Salt Lake City, UT (February 1, 2012) – The Larry H. Miller Tour of Utah organizers announced the host cities for the 2012 event. The six day, UCI 2.1 rated stage race will be held from August 7-12, 2012 and will feature 16 teams, including at least five top pro teams. This year’s tour will include six stages: five road races, and a team time trial. It promises to be one of the most challenging to date. The race will be headquartered this year in Ogden, which will host the stage 1 road race. Stage 2 will feature a Team Time Trial and will be held at Miller Motor Sports Park in Tooele. The Team Time Trial is one of the most unique features of the 2012 Tour of Utah. This is a technical discipline which holds special interest for cycling fans, and is the only race against the clock for teams at a North American UCI stage race this year. Salt Lake City will host finish lines for Stages Three and Four, with plans underway for a large community celebration on Friday, August 10 following the road race. Stage Four will begin in the Lehi area of Utah County, which has seen Tours in past years. This stage is still under development. The signature climbing route from Park City to Snowbird, known as the “Queen Stage”, moves from the final Sunday of race week to Saturday. Park City will also host the final stage 6 road race on Sunday, August 12th. “The Tour of Utah continues to grow in stature as a major cycling event in North America. When you get calls from teams around the world to come to Utah, then you know you are doing something right. We thought the timing was right this year to launch a new brand for the event, and you’ll see more changes in the coming months. It takes a great deal of support from all our partners, the State of Utah, civic and county leaders, special venues, sponsors, volunteers and our loyal fans. We value all this support as it keeps Utah at the forefront of professional sports around the calendar,” said Steve Miller, president of the Utah Cycling Partnership which owns the Tour of Utah. “Last year, my goal clearly was to repeat as the overall champion of the Larry H. Miller Tour of Utah. It was an unbelievable victory and a great event. It's exciting to watch the Tour of Utah succeed and rise in the ranks as a world-class, UCI race,” said Leipheimer, the two-time champion of the Larry H Miller Tour of Utah. The Butte, Montana native, who went to high school in Utah, will race this year for the top-rated Omega Pharma – Quick-Step Cycling Team based in Belgium. “With all the elevation gains and climbing, I feel that the Tour of Utah is one of the toughest stage races in America today. The Larry H. Miller Tour of Utah began as a three-day Thanksgiving Point Stage Race & Cycling Festival over Memorial Day weekend in 2004. The Utah Cycling Partnership, owned by family members from the Larry H. Miller Group of Companies, purchased the event in 2007 and re-launched the cycling event in 2008 as a five-day National Racing Calendar event. Last year the Tour of Utah was elevated by the Union Cycliste Internationale (UCI), the worldwide governing body of cycling, to a 2.1-rated event for the UCI America Tour. The Tour of Utah is sanctioned by both USA Cycling, Inc. and the UCI. The Larry H. Miller Tour of Utah continues to be free to all spectators, making professional cycling one of the most unique pro sports in the world today. For more information, visit tourofutah.com. One Response to "Larry H. Miller Tour of Utah Announces Host Cities"
Can’t wait. I only hope the PC is an actual stage, and not a crit parade.